Steve – 9, Lung disease—a big fat ZERO! This might sound corny, but I feel like Ive just been reborn. 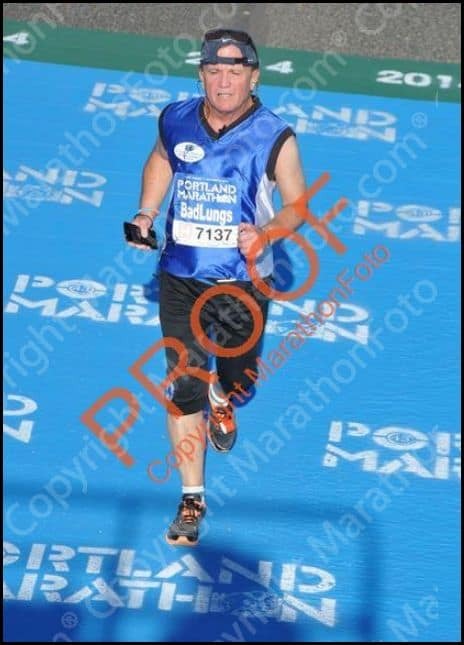 On Oct 5th I finished my 9th marathon at the Portland Marathon. If you’ve been reading my updates, this was a scheme I had hatched while hospitalized back in July. I was feeling incredibly down at the time and was curious to see if I had another marathon left in me. I hadn’t done one in 3 years and after a couple failed attempts, had pretty much written off the idea of doing anymore. My biggest concern in preparing for this particular race wasn’t my lungs (Ive learned over the years that they’re gonna do what they wanna do regardless of how well I take care of myself). No, my biggest concern wasn’t my breathing, it was my damn feet! For the first time in 10 years of training for these walks, I started having lots problems with blisters. I don’t know if it was a shoe problem, or a bad gait, or just soft skin, but I was rapidly running out of time and had even considered withdrawing from the race if I couldn’t resolve the issue. I tried difference styles of shoes, expensive double socks, anti-frictions powders, you name it. In the end though, I decided to go for it and hope for the best. If I developed a hot spot I would treat it on the spot the best I could. I had a first-aid just for blisters. More about my feet later. So now it’s race day. It’s still semi dark outside and 15,000 of us are lined up in our various corrals, A thru H. I was in corral H, the one for the slowpokes. I wasnt alone though, there were probably about a thousand of us in that one corral, most of us waiting to use the Porta potties one more time. At just a few seconds past 7am with the send-off music getting louder the announcer comes on the PA and and invites everyone join along to recite the national anthem. And just before he does the final countdown, he say’s “Good Luck everyone, and please look out for each other on the course”. I thought to myself, Wow, I really like. Putting competitiveness aside for a moment, whether you were a runner or walker, young or old, fast or slow, full marathon or half, those words really made you feel like you were part of the a larger community whose members shared the same goal of reaching the finish line for which they trained so hard for. And with that, I was off for a 7 hour and 21 minute jaunt in and around Portland. I actually did really well for first couples of hours. 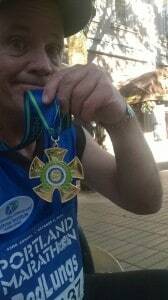 My pace was in the mid 14’s, my breathing was good and my legs felt strong. But as the day worn on it started to get really warm on the course and things went from good, to bad…to downright uncomfortable. What actually turned out to be my biggest problem wasn’t my feet at all, it was actually something quite preventable…dehydration! As usual, I didn’t drink enough in the days leading up to the race. And while I knew they were predicting a warmer than average temperatures on race day, I had no idea it would get as hot as it did. Then when you factor in all of the asthma and blood pressure meds I took that morning, the combination of energy gels and unfamiliar electrolyte drinks that I consumed along the way, it’s no surprise I would eventually have problems..and boy did I. By mile 12 (about 3 hours in) it had already reached 80 degrees, and to make things worse we were walking/running in the direction of the sun. I was sweating a lot and tried my best to compensate by drinking water and electrolytes at every water station, but it wasn’t working. They say that if you actually feel thirsty, that’s already too late. Now I know why they say that. Don’t know if was the heat, my medications, or dehydration setting in, but from mile 14 onward I was plagued by bouts of nausea and GI cramps. I found myself continually scanning my surroundings for a place to relieve myself in the event of a bathroom emergency. Unfortunately, there were no such places, which just added to my anxiety. To their merit, the Portland marathon provides more porta potties on the course than most other larger marathons. But still, when you’re feeling constantly queasy and not sure what your body is going to do, a toilet a half mile away is not very assuring. Anyway that’s pretty much the way it went for the rest of the race. I would feel fine for a few minutes after downing a gel or drinking some water, and then the queasiness and cramps would hit me all over again. I was too afraid to pick up my pace, not so much because of how my lungs might react, but mostly for fear of puking… or worse. (Btw, my split times mirror these nauseous periods almost perfectly). I think it was around mile 25, about 7 hours into this thing that the hot weather was really starting to get to me. It was now 85 degrees and I was overheating so badly that it was making me dizzy. I couldn’t even walk a straight line anymore. 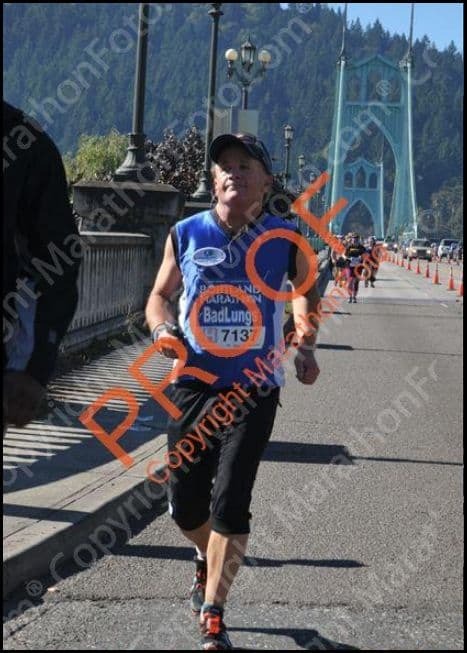 Finally, after making it across the 2nd bridge and back into downtown Portland, one of the course monitors/medical people who was standing at one of the intersections could tell I was having problems and was threatening to take me off the course for my own safety. 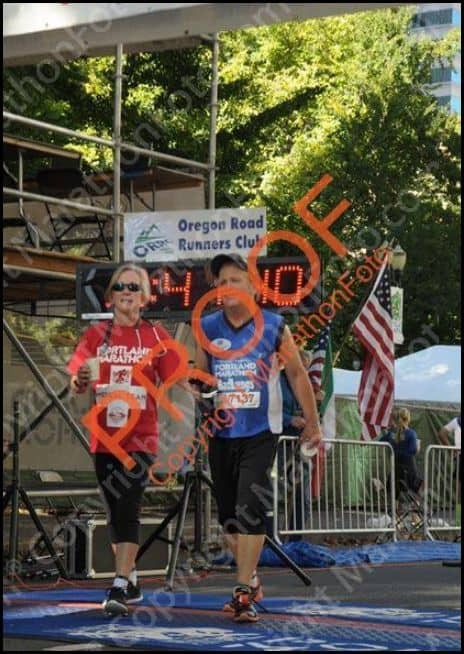 Knowing how much finishing this race meant to me ( especially after completing 25 and a half miles of it), this person(I remember her name was Ann) as a compromise, offered to walk with me the remaining half mile to the finish line to make sure I made it there safely. I was very appreciative, but by this time I was was so out of it, I couldn’t even think straight. She kept asking me questions ( I think to divert my attention), but I was so nauseous and paranoid that I would vomit(or worse)at any moment, that I just mumbled back my responses to her. This however made her even more nervous and I could see her motioning to other medical people. Anyway, it must have taken us 15 minutes to cover that last half mile. It finally got to the point where I couldnt hold it anymore. With the finish line just a few feet in front of me, and in true Steve fashion, I proceeded to puke and wretch my guts out for the world and all the finish line cameras to see. Sweating and drooling profusely, I straightened myself up crossed the finish mats. The vomiting episode was seriously embarrassing to me, but except for the medical people, no one seemed to really care. In fact , one of the photographers approached me afterwards and asked if Id like to have my finish photo re-taken. I was so out of it, I said , no thanks Im not in the mood. They handed me a finisher metal and then escorted me directly to the medical tent where they tried to cool me down and re-hydrated me. An hour later I was feeling a lot better, and they cut me loose. Turns out, I lost 6 lbs of body weight during that 7 hour walk. Hard to believe a person can sweat out 6 pounds of water in such a short period. So yeah, I guess I was pretty dehydrated. In all the commotion I totally forgot to pick up my finisher shirt, my finisher jacket, commemorative pins and my tree seedling. And while I usually end up giving most of that junk away, this race was special. It would have nice to have a few keepsakes. On the asthma front, I started getting tight about every 15-20 minutes, so I used my inhaler a lot. I used it exactly 24 times during the race. I know this for a fact, because I started out with a brand new inhaler which holds 200 puffs and when I finished the race the counter was reading 176. For the most part though, my lungs were champions. (Plus, I think I was so distracted by the other issues that I wouldn’t have realized if I was getting severely short of breath anyway). I didn’t perceive and audible wheezing until almost the finish of race and didn’t require any nebs treatments until after I got back to my hotel room later in the day. As far as the recovery, I was still really dehydrated and super thirsty the evening after the race, so I ended up drinking a ton a liquids. With the exception of some really REALLY painful leg cramps which kept me awake that first night, my recovery as gone fairly smooth. 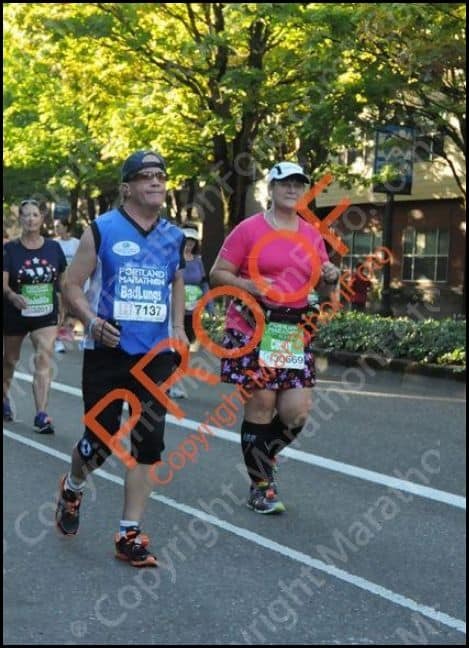 Oh and regarding my feet, miraculously I didn’t develop any blisters until after mile 20 . 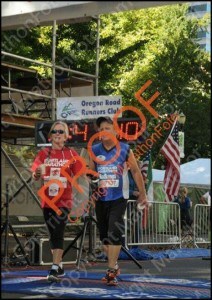 As you can see, they were doozies, but I was so preoccupied with trying to finish the race, that I blocked out the pain. Its been 4 days now and all of these blisters are finally healing and Im able walk without a limp once again. Ah, the pain we’re willing to endure for the sake of finishing a race. So there you have it. I completed my 9th full marathon at age 60 with ultra crappy lungs. In doing so, I’ve concluded that I am indeed one tough cookie ( aka badassthmatic) who not only talks the talk, but walks the walk. Im proud of my accomplishment and wouldn’t trade it or all the good breathing days in the world.